ORLANDO | St. James wrote, “If a brother or sister has nothing to wear and has no food for the day, and one of you says to them, “Go in peace, keep warm, and eat well,” but you do not give them the necessities of the body, what good is it? So also faith of itself, if it does not have works, is dead” (James 2:15-17). Our living faith calls us to care for each person, so dignified by God. 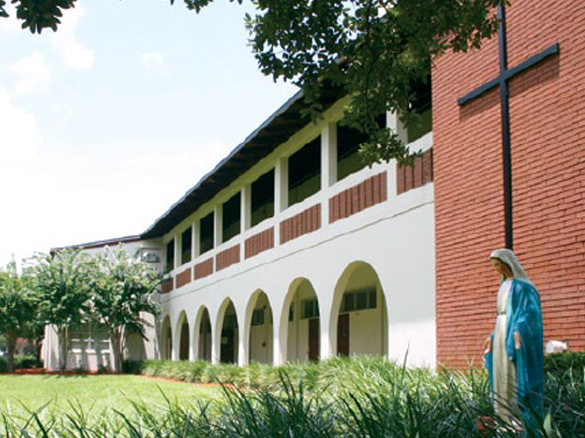 In light of this, the people of the Diocese of Orlando continue to work diligently to implement top-notch security for every school and parish in the nine counties we serve. As phase one of the partnership with Life Safety Solutions nears an end, significant strides have been made and the diocese is determined to launch phase two with careful consideration. Life Safety Solutions is a Florida-based company that specializes in loss control, risk management, and safety and security services. The security team has been on the ground in Central Florida since May 2018 and has completed vulnerability assessments for 37 schools and early learning centers along with their parish communities. Those reports have been shared with both principals and pastors. “A lot of the issues will be addressed in training and emergency plans,” explained Tracy Dann, risk manager for the diocese. “The physical changes are currently being mapped out based on priorities made by Life Safety.” The diocesan office of finance is also working with individual locations to develop funding plans for those improvements. Raptor Visitor Management software has been installed at each school and some parish locations to screen visitors, volunteers, and contractors against the sexual predator/offender database. When there’s a hit on the system, parish staff and school administrators are notified immediately. Lanyards have also been implemented for easier threat assessment. “Everyone will be identified as staff, visitor, volunteer, or contractor,” said Dann. “Every lanyard will be a different color so that from a distance you can see who is and who is not supposed to be on campus.” Two-way radios have been purchased to allow for better communication in the event of an emergency between the church and school community and local law enforcement. The diocese has committed to annual security reviews for continued success and a security committee has been established to serve as an advisory group to improve overall practices and protocols. The team dedicated to this project is making sure it ties back to Catholic teaching every step of the way. “As Catholics, we have a moral responsibility entrusted by God to uphold the spiritual, emotional and physical well-being of each person as they participate in activities within or sponsored by our diocese,” noted Bishop John Noonan. “It is our responsibility and commitment to providing an environment that is safe and nurturing.